Creating amazing mobile apps is no more a challenge. Thanks to the consistent advancements taking place in the world of mobile app development.Today, we have an easy access to multiple open source front-end SDKs (Software Development Kits) which have enabled us to come up with a brilliant mobile app that exceeds all expectations. 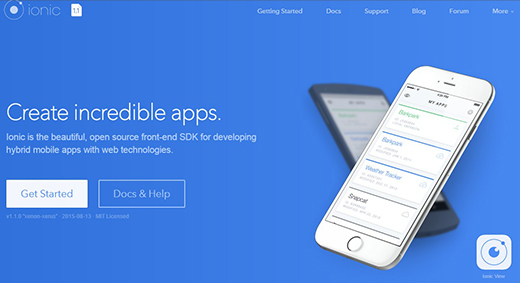 Ionic is a remarkable HTML5 App Development framework which you should definitely know about. Through this post, I intend to highlight the significance of this truly effective framework that has been serving as the backbone for highly interactive and visually impressive Apps. What you will find with the Ionic Platform Services? The lack of .config()- It is interesting to note that all apps which have been synchronized with the Ionic platform can now automatically fetch the information that’s required for communicating with multiple servers. In other words, the API key along with App ID are automatically set as per your requirements. Lack of hassles associated with using index.html and injections- To get started with using the Ionic framework for app development, just type in the terminal, ionic add icon-service-push and all the required files are automatically added into the desired location, enabling you to focus on coding your HTML5 Mobile app. Prevent from having your code in the cloud- If you’re about to start a new app development project on apps.ionic.io but aren’t interested in having your code in the cloud, all you need to do is simply run ionic io init and you can get going with building outstanding mobile applications. Unlike a wide range of hybrid mobile app development frameworks, Ionic allows you to focus on not only the specific layouts but even the wide collection of transitions and styles in the most appropriate format. For instance, in case of an app built using the Ionic framework, the menu toggle button would be placed on the left side in case of an iOS powered device and the same button would be showcased on the right side in case of an Android powered device. That’s not all! With the beta 14 version of the Ionic framework, you’ll find a new feature called $ionicConfigProvider which can be used during the app configuration phase for overwriting a certain style, transition or behavior. Additionally, during the app’s runtime, you can conveniently use $ionicConfig for setting and fetching config values in your controllers or specific app services. With Ionic, the initial code that you’d be working with would be an Angular project. So, if you’re comfortable using AngularJS, then using Ionic shouldn’t be a problem for you. The Ionic framework offers you multiple directives for the Angular application, thereby making it convenient to use varied UI elements like lists and cards quite simple to use. In Ionic, the main Ionic tool i.e. the CLI is being wrapped around so as to make it less tedious to work with the PhoneGap/Cordova projects. However, you may also opt for using the UI/UX components in your hybrid app or mobile-optimized web pages. As a Cordova developer, you may proceed ahead with mixing the CLI with ngCordova for wrapping the Cordova CLI commands. For instance, you can start a new project with Ionic CLI and grab the opportunity of working with the related plugins and platforms as well. The details above would have definitely impressed you with the Ionic framework. So, grab your chance of building the most impressive and feature-loaded mobile app using this effective framework, today. If you have anything to say about the Ionic Framework, please share your opinion in the comments section. Your opinion matters, unless it is a Spam. Amanda is currently working for Xicom Technologies Ltd- a renowned Android App development company. She has been an avid IT personnal with special interest in writing posts that serve as handy guide for individuals looking out to build a strong career in IT services and solutions sector.